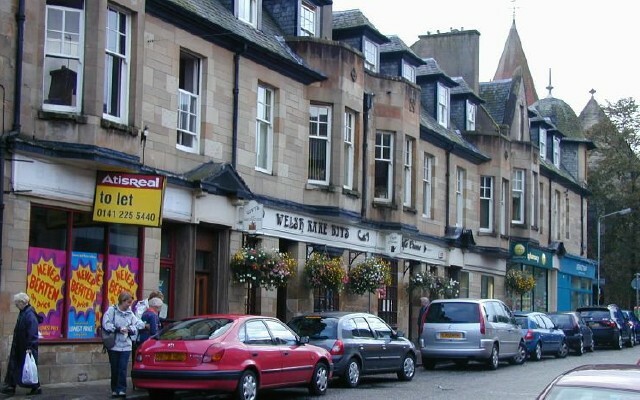 Bearsden High Street @ High.St - High Street shops and High St businesses. Large Google map of Bearsden High St.
Bearsden is just 6 miles (10Km) North of Glasgow's city centre. Combine this with some good housing, frequent rail service and a neat square of essential shops with free parking and Bearsden becomes an attractive place to live. The centre is called Bearsden Cross and has its own website that provides additional information about the town and local area. We first list the shops on the main North to South Drymen Road (A809); then those on the North edge of the square, either side of New Kirk Road; finally, we list the shops on the South edge of the square, on Roman Road.